We know how much our customers, and BMW owners at large, feel about their sedans and SUVs. That is why we pride ourselves on being the go to shop for BMW owners in Columbus OH. We are just as passionate about your vehicle as you are, we know them bumper to bumper. Here at Mike’s Foreign Car Service we have the tools and knowledge to help you maintain and keep your BMW running at it’s peak level of performance no matter if it’s old or new, we love BMWs. There are those auto repair shops that repair and service any and all vehicles, but we like to think of ourselves as the best place for BMW owners to come and have their vehicles serviced. If you don’t have the time to drive all the way to the dealership or if you BMW is out of warranty, we will give it the same attention with equal expertise and help you keep the value and dependability of your vehicle. With regular maintenance, we can help you prolong the life of your BMW. We can also suggest a maintenance schedule that works for you and your BMW based on your driving habits and seasonal weather conditions. It doesn’t matter how old your BMW is or how many miles it has on it, there are parts of your vehicle that are subject to wear and tear. We can help you stay up on your maintenance schedule to help prevent costly repairs and maintain the reliability of your BMW. We understand that you BMW is both an investment and your mode of transportation, you rely on it for both work and play, let us help you keep it running at the level you’ve come to expect from your BMW. We know that Mercedes Benz owners are interested in high quality repairs and maintenance services when it comes to taking care of their luxury automobiles. That’s why we work hard to stay on top of the latest trends in the automotive repair industry to provide you with the best maintenance and repair services available. We can quickly diagnose any issues you may be experiencing or perform a maintenance service for whichever mileage milestone you are approaching. 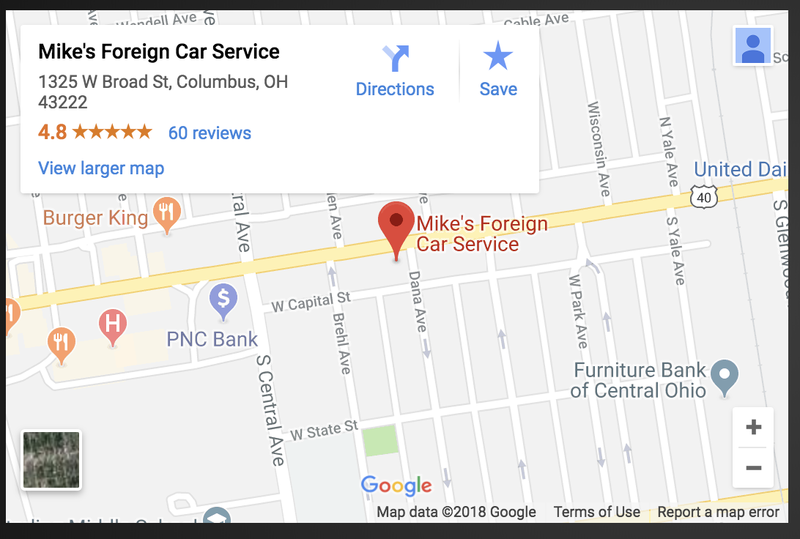 Here at Mike’s Foreign Car Service, we pride ourselves on showing you how knowledge and excellent customer can make a big difference when it comes to your automotive repair and maintenance experience. Audi’s classic style and look helps them stand out from the crowd and we want to give you that same type of feeling when it comes to your automotive maintenance and repair needs. We have experienced technicians that can quickly diagnose and service your Audi, making sure that it is both safe and reliable before you get back on the road. As with any vehicle, regular maintenance services can help prolong the life of your vehicle and keep it running at its peak level of performance. So no matter if you drive a sedan, coupe, SUV, BMW, Audi or Mercedes Benz. Give us a call, drive on into our shop or conveniently schedule an appointment online for a day and time that works for you! Located at 1325 W Broad St, you’re never far from getting your BMW the help it needs to remain safe and reliable.